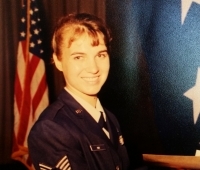 In 1989, as a senior in high school, Bridget decided to postpone college while she served her country as an enlisted member of the U.S. Air Force. Within only a few weeks after graduation, she was in combat boots, training in San Antonio, Texas. From the start, Bridget excelled in her military assignments. During her job-specific technical training in Biloxi, Mississippi, Bridget served in the highest echelon of student leaders. Among 500 Airmen in her Squadron at the time, she and only two others were selected to wear a "red rope" as a sign of their cream-of-the-crop standards of behavior, appearance, attitude, performance, and leadership. Bridget's first assignment after that training was at Loring Air Force Base, Maine. There, when the radar equipment used by the air traffic controllers required repair, she carried a tool box and drove a maintenance truck onto the airfield between F-15 and B-52 bomber flights to return the equipment to mission capable. She received an early promotion to Senior Airman for excellent service in this role. From Maine, Bridget transferred to Lajes Air Field, Portugal. Bridget was hand-picked to brief senior officers daily when any of the radar, radio, satellite, or navigational equipment was down and planes needed to land. Based upon her ability to articulate critical information under stress, Bridget was selected as the Group and Wing Airman of the Year in 1993, and ultimately as an Outstanding Airman of the Year for the entirety of the Air Combat Command in 1994. She was promoted to non-commissioned officer the following year. After a successful and enriching 6 1/2 year military career, Bridget chose to separate to pursue her college and law degrees. Her composure under stress, work ethic, and desire to serve were all honed during this time, and remain vital aspects of her character today. Before separating from the military in 1995, Bridget was promoted to Staff Sergeant.